Anovos is proud to offer the Velour Line tunic from Star Trek's original series! 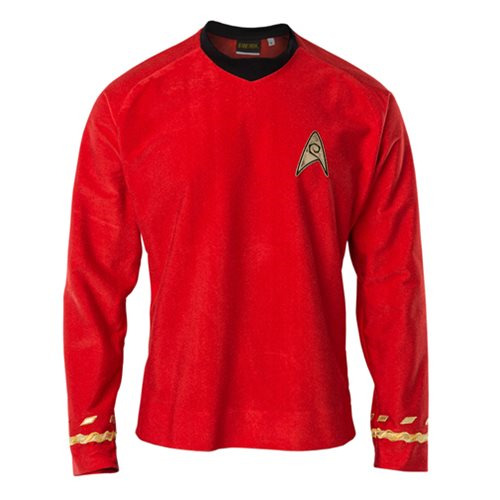 The Velour Line is an affordable costuming option that replicates the soft velour fabric used in the early production of Star Trek's original series. This tunic includes details replicated from original screen-used production assets. The velour fabric has been custom-milled and dyed to match the original screen-used tunics, with a collar made from original style black ribbed material. An "Invisible" zipper is hidden in shoulder seam, with Starfleet insignia replicated from original Season One and Season Two patches. Rank braids feature early Season One reverse helix pattern matching appropriately to Scotty's style! Hemline, cuff, and side gussets allow for additional tailoring.